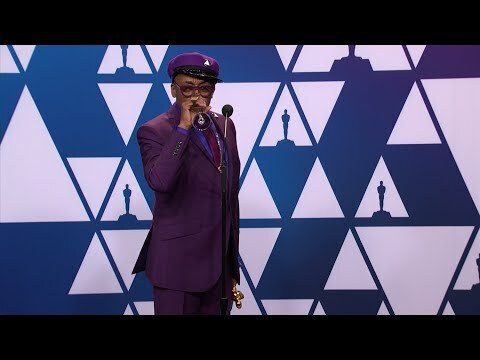 LOS ANGELES (AP) — Spike Lee’s first-ever competitive Oscar award turned a mostly staid ceremony into one with joy and passion, but that later gave way to frustration. Lee, who captured the best adapted screenplay trophy for “BlacKkKlansman,” jumped into the arms of presenter, longtime collaborator and close friend Samuel L. Jackson when he took the stage Sunday to accept his award with Charlie Wachtel, David Rabinowitz and Kevin Willmott. The audience gave him a standing ovation. But Lee’s mood appeared to turn sharply when the trophy for best movie went to competitor “Green Book.” Seated in the audience, a visibly angry Lee waved his hands in disgust and appeared to try to walk out of the Dolby Theatre. He made his way back to his seat and later backstage to answer questions. “This is my sixth glass, and you know why,” he said, smiling and holding a champagne flute aloft when he met with reporters. He briefly touched on his reaction to the “Green Book” win. “I’m snake-bit. Every time someone’s driving somebody, I lose,” Lee said. He was drawing a parallel between “Green Book,” about the real-life Southern journey of a white man driving African-American pianist Don Shirley, and the 1989 best-picture Oscar winner “Driving Miss Daisy,” about a wealthy white woman and her black chauffeur. “Green Book” has been lauded by its makers and cast as tribute to racial tolerance, but critics have condemned it as sentimental and outdated. Lee’s film includes footage of Trump after the 2017 violent white supremacist protests in Charlottesville, Virginia. Trump claimed that he had “done more for African Americans” than “almost” any other president.